Well, I’ve been at deVOL for around 8 months now and I keep reading everyone’s lovely blog posts thinking I would just love to write one about my journey so far. So let’s start from the beginning, shall we? 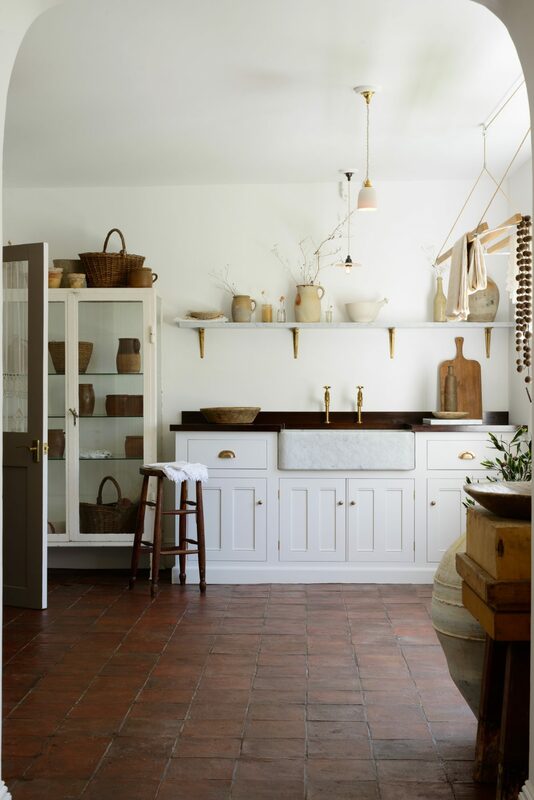 It all started last September when I applied to be a Graphic Designer here at deVOL. 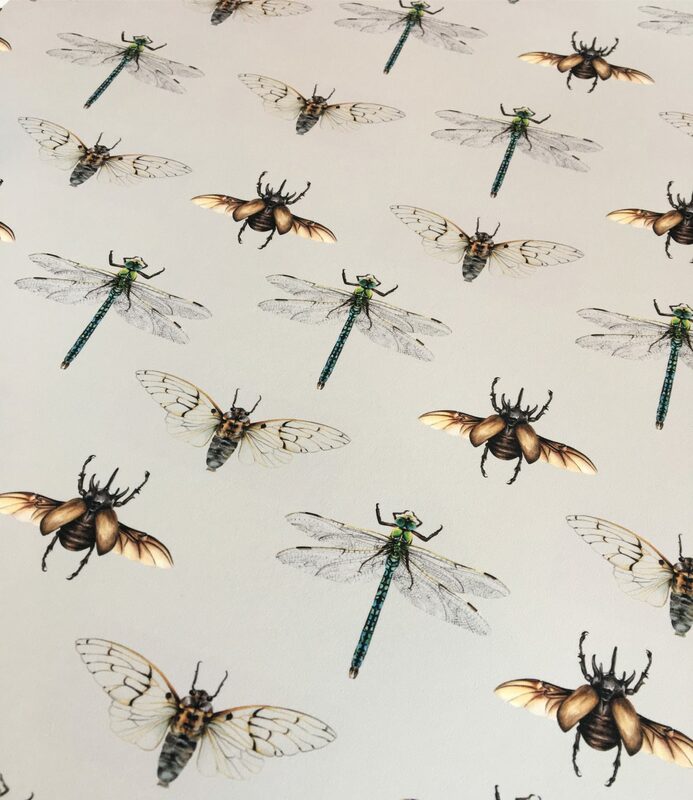 A few days later I got a very exciting phone call from Huw, our Creative Design Manager, telling me all about a new ‘Decorative Artist’ position they were looking for and he was wondering if I would be at all interested. Well, I couldn’t quite believe my luck. I think I remember saying in my interview “you’ve created my absolute dream job” and it is just that. I have filled the last 12+ years of my life spending my spare time drawing, painting, and being creative in any way I can – and now there was an opportunity to get paid to do just that! 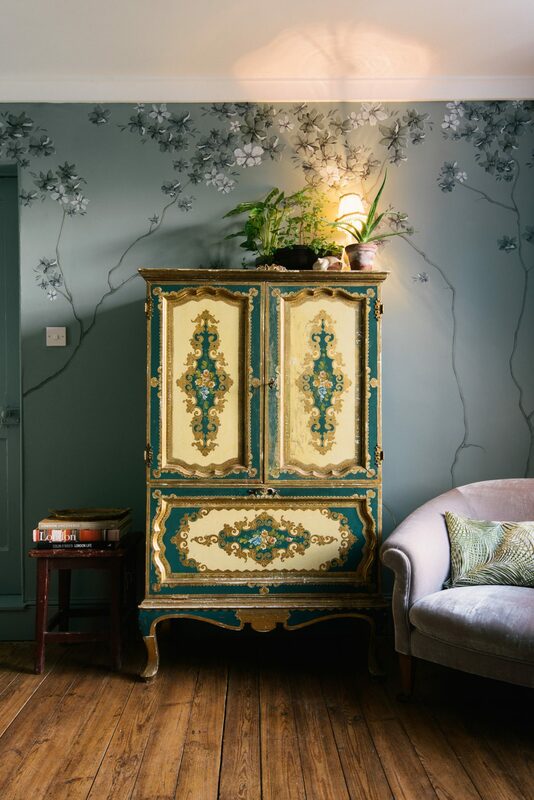 This old painted cupboard worked perfectly against the watercolour wall. 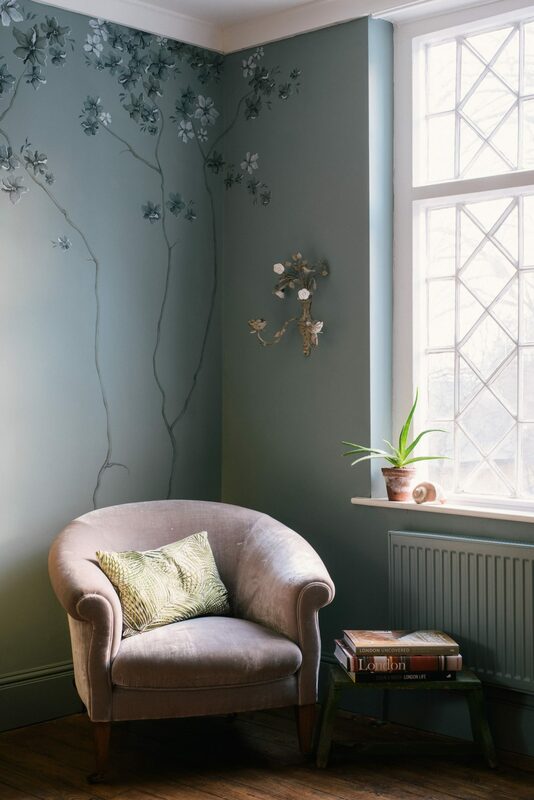 The branches I painted on this wall were very subtle and fitted so nicely behind this old velvet chair. I spent my first few weeks at the Mill spending all my time in what we now call “the blue room” which, if you’ve visited our showrooms in Loughborough recently, you’ll know just what room I’m talking about. 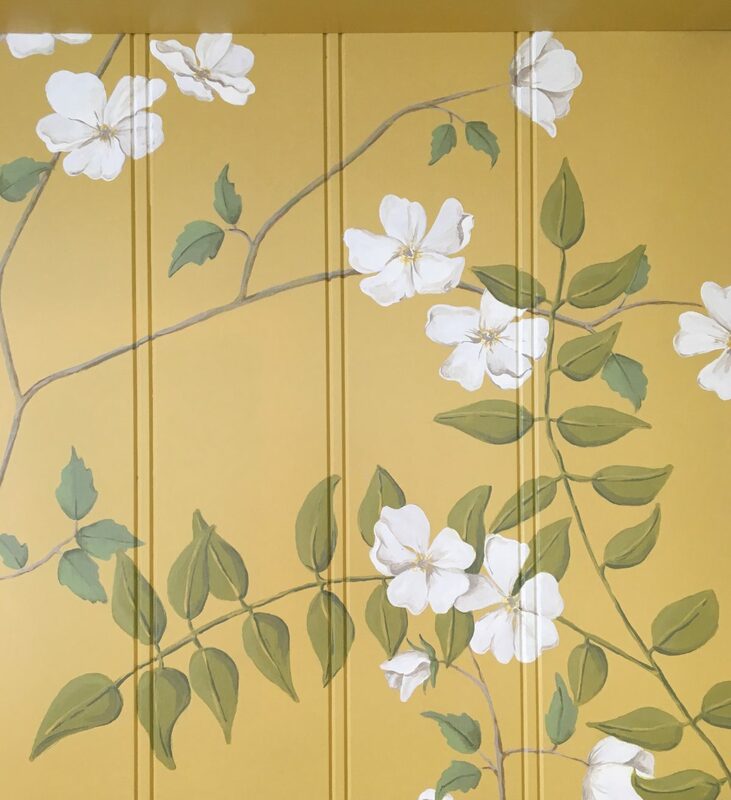 Paul, deVOL’s Director, and Helen, our Creative Director, had expressed that they wanted the walls to look very organic, matte and natural; but because this was all new they weren’t completely sure on what they wanted. Every time Paul, Helen, and Huw came down to see what I was getting up to, we would have mini design meetings about what worked best and we eventually refined the idea down. We ruled out acrylic, emulsion, and gouache and were left with watercolour. 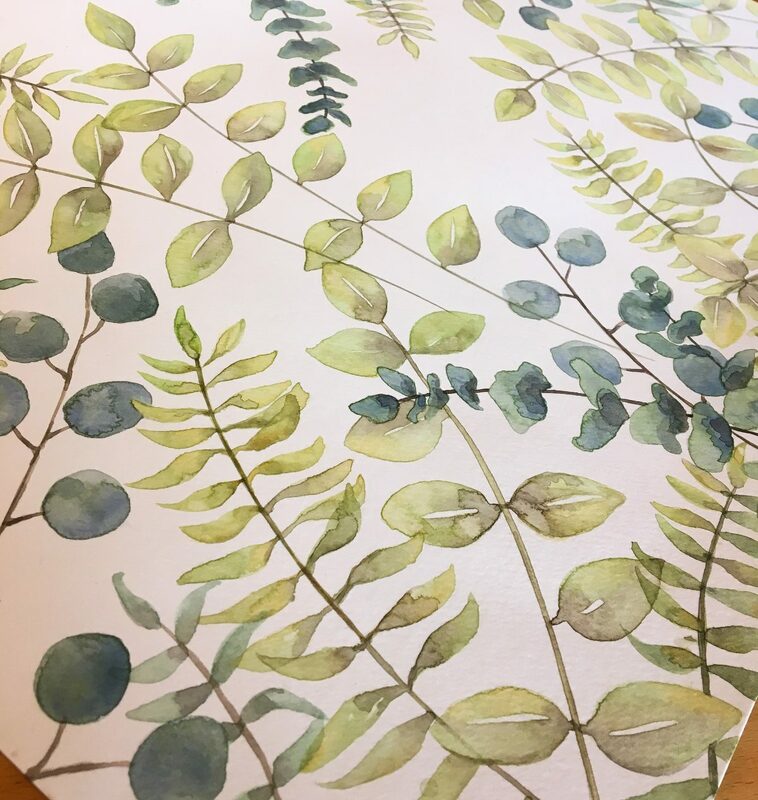 I don’t know if you’ve ever painted with watercolour paints but they aren’t so easy to use on a vertical wall! The flowers that started it all. 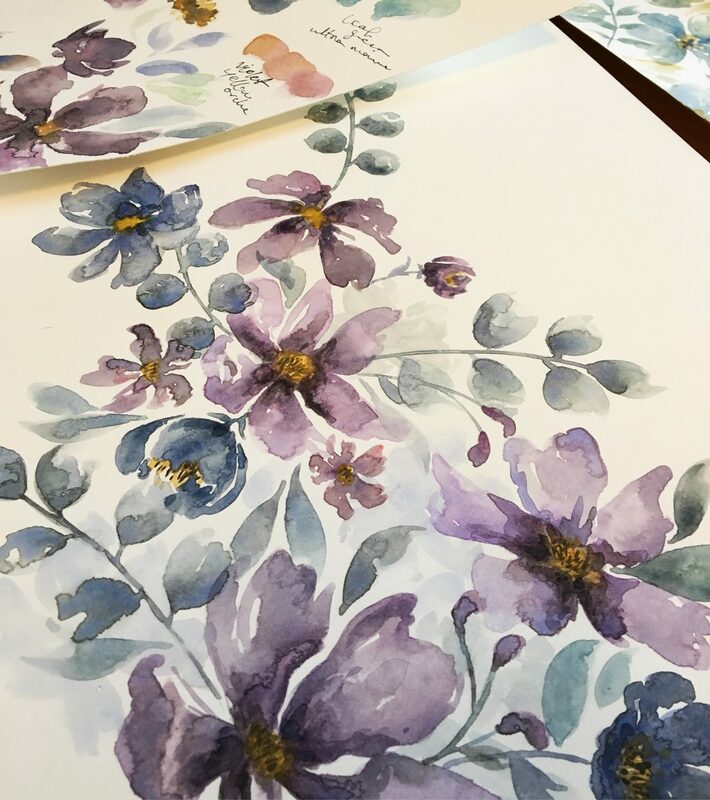 One day I painted some flowers on the wall using a hairdryer, many layers of watercolour and a few accidental drips, and they were the ones! We had to decide how they would work in the space, so I photographed the flowers and printed out about 200 copies. 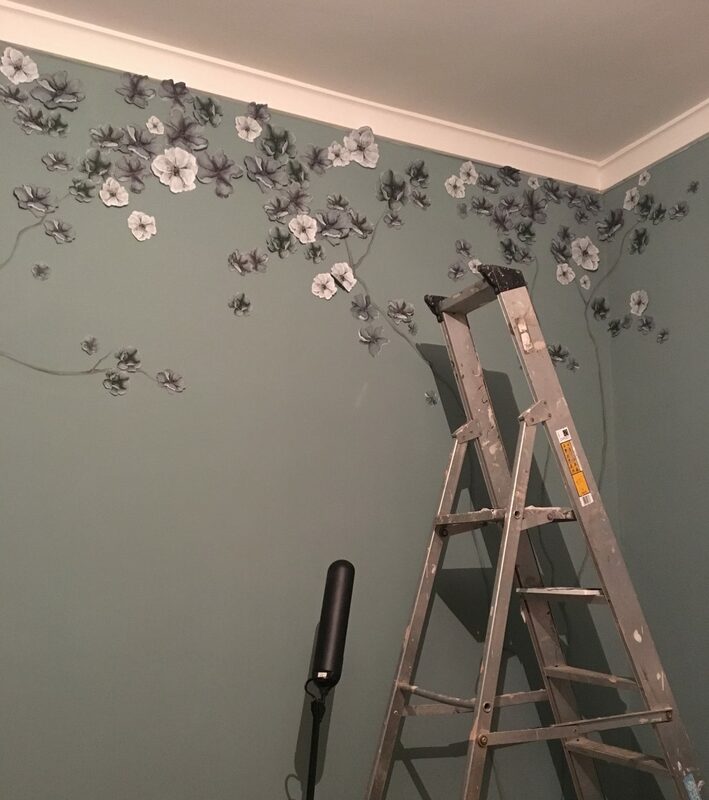 We had fun sticking them all over the walls, moving them around to create a really blossoming composition. When we had finished, it was a great relief to have come up with something really special that worked well in the room. However, I then had the feat of about 150 individual flowers to paint in watercolour. I was nervous at first because I hadn’t done anything to that scale before, but I ended up having the best time in that little blue room. I listened to audiobooks, a lot of Taylor Swift, and actually started to learn Italian – something I still keep up with to this day. I had the most beautiful view over the millpond to greet me every day and kept pinching myself that I had actually landed a job in a place so utterly stunning. The ladder that served me well the best part of 2 months, next to a wall full of stuck-on, ready-to-be-painted flowers. The view from the blue room that I just can’t get enough of. The second room I painted was in the newest part of Cotes Mill – the Millhouse showrooms. These three rooms were still being developed when I moved my little ladder and paintbrush in. It was such fun to watch these magnificent showrooms developing around me every day. I got a great insight into all the hard work and effort that goes into what they do here at deVOL. The absolutely stunning new kitchen showroom. Utility room inspired by old-style Italian kitchens. When I was researching for this room I had a much better idea of the style that deVOL loved so it was a lot easier to get started. When Helen was telling me her initial thoughts for the space, I got really excited. 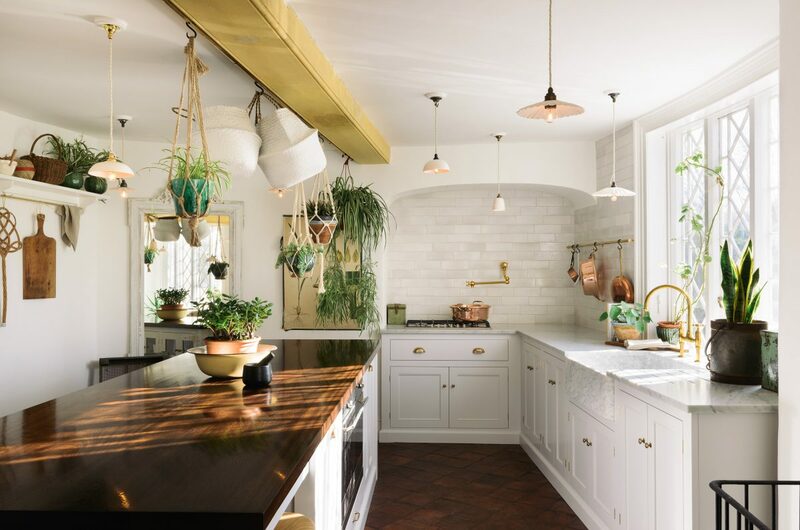 She talked about creating an old-style Italian kitchen with terracotta floors, white walls, marble sinks, and she wanted to completely fill it with hanging plants. It sounded like a dream! We settled on the simple, humble cow parsley, but we went big! 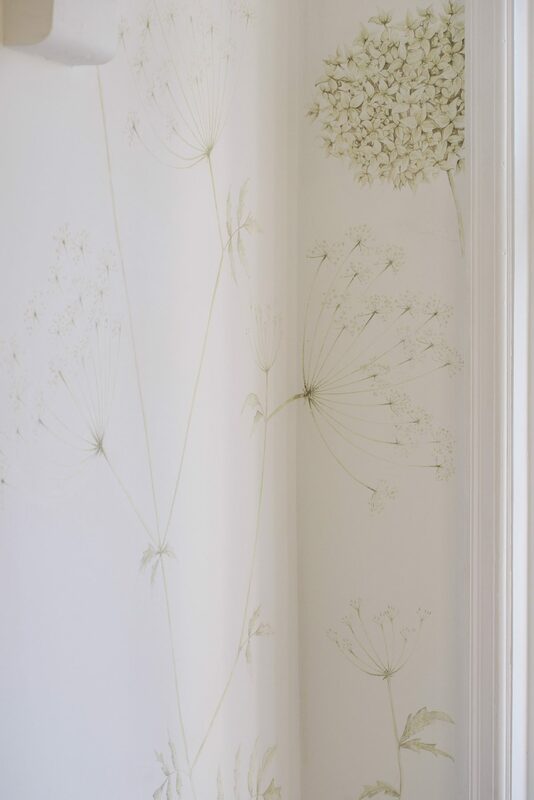 The cow parsley was angular with a contemporary feel and was a lot more sparse than the blossoming florals upstairs. Towards the end of my time painting, when the room was starting to come together, everything just seemed to fit so perfectly. It was almost like the view from the huge window was carrying on into the showroom. Gorgeous hanging baskets mixing well with the watercolours. 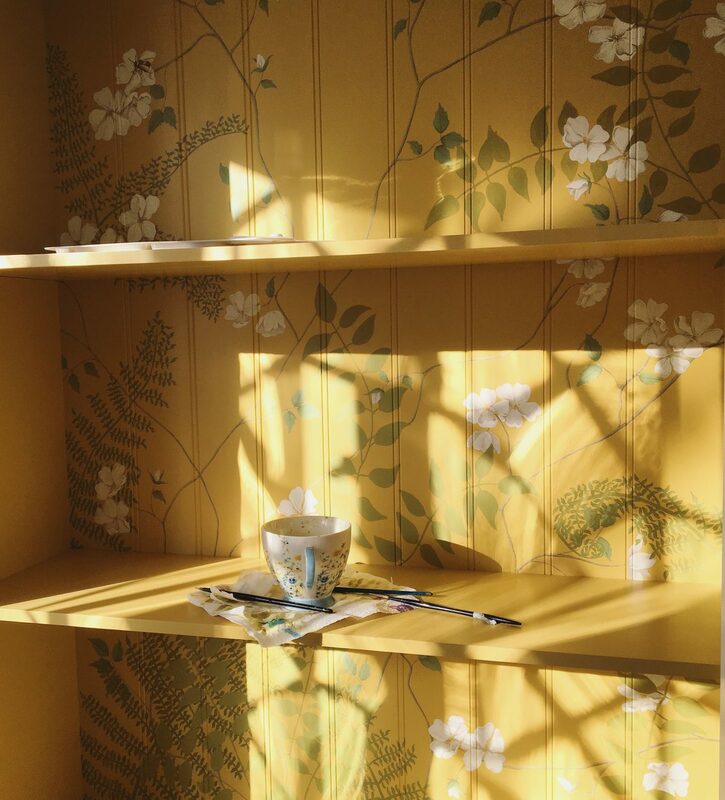 Painting the sunny cabinet on a sunny day. 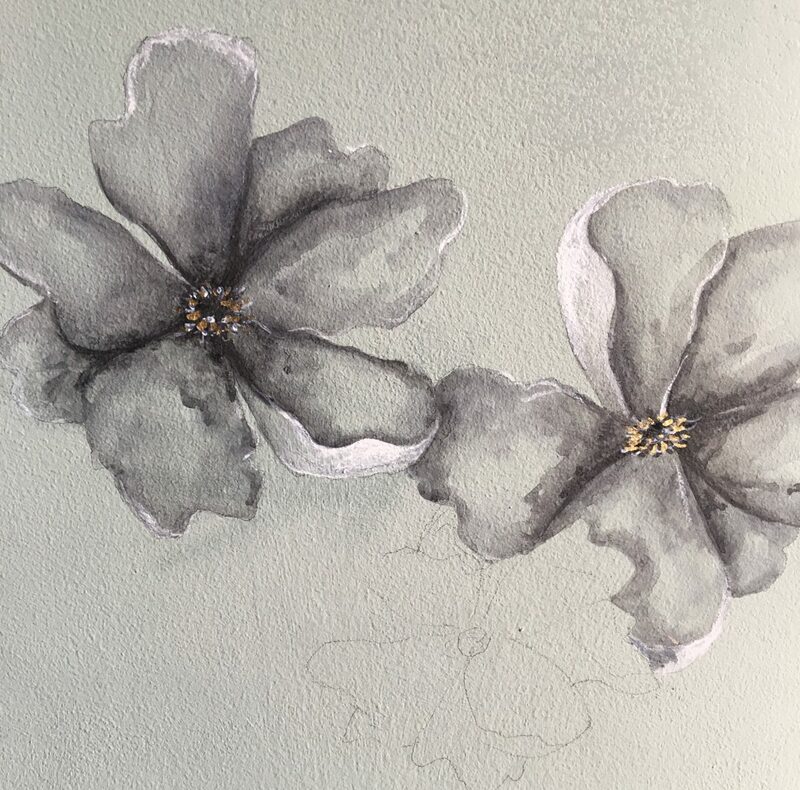 Some details of the dog roses. The styling really made this piece. 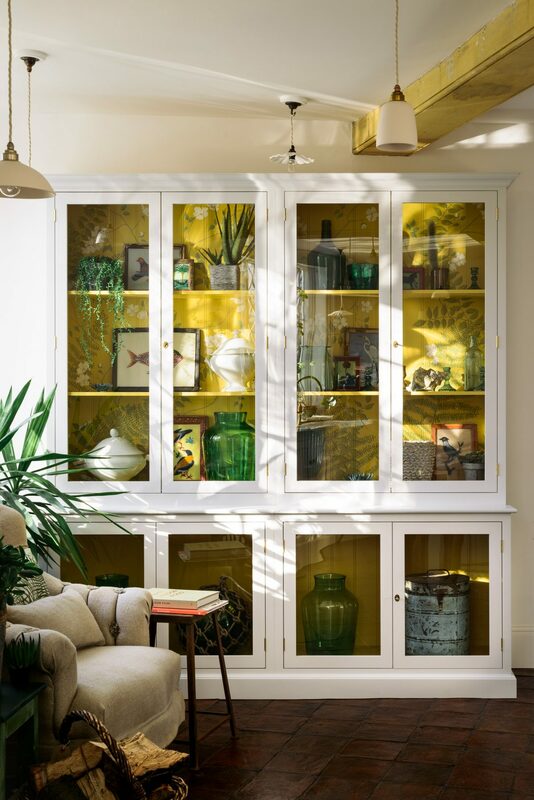 Helen filled it with gorgeous old vases, pots and pictures that she had picked up from various antique fairs. 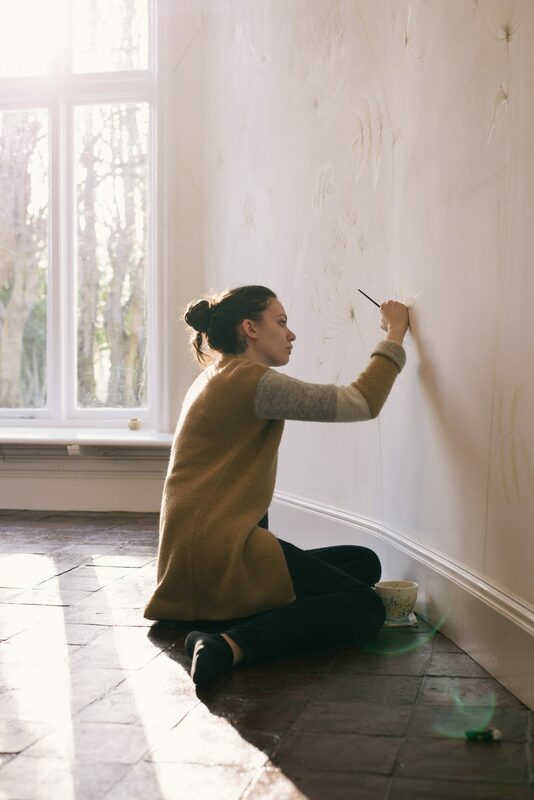 My favourite thing by far about all the paintings I have done is right at the end when the room gets styled and the photographs get taken by Tim. It’s like everything comes together and starts to make sense, like the painting was meant to be there all this time. So many great colours and items in this cabinet. It’s really something special to showcase beautiful things. I’ve been working on some exciting smaller projects since then. I painted the windows of Cotes Mill ready for the springtime. This was really different for me and was such fun. The peacocks always came up to see what on earth I was up to and made me laugh way too much. 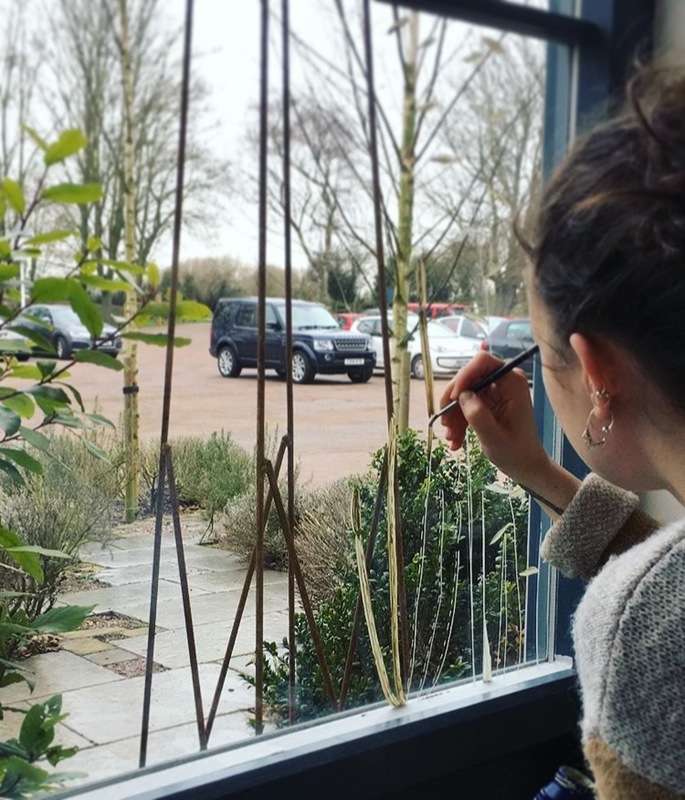 Window painting at Cotes Mill. A section of the finished window. 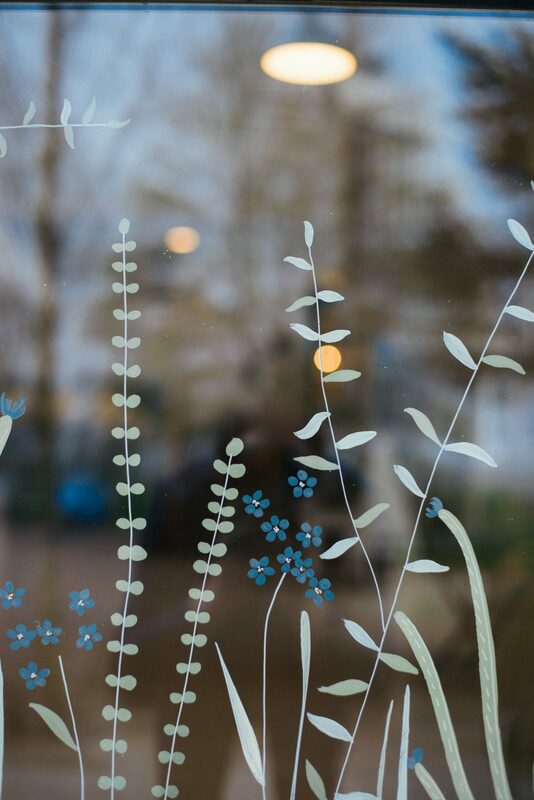 We kept it simple and natural, with trailing leaves and small blue flowers to match the blue painted building. I’ve also been developing a little range of wrapping papers and hand-painted cards to sell here at Cotes Mill. So what am I up to at the moment? Well, we are currently experimenting with the idea of hand-painted ceramics, each piece completely unique in its own right. 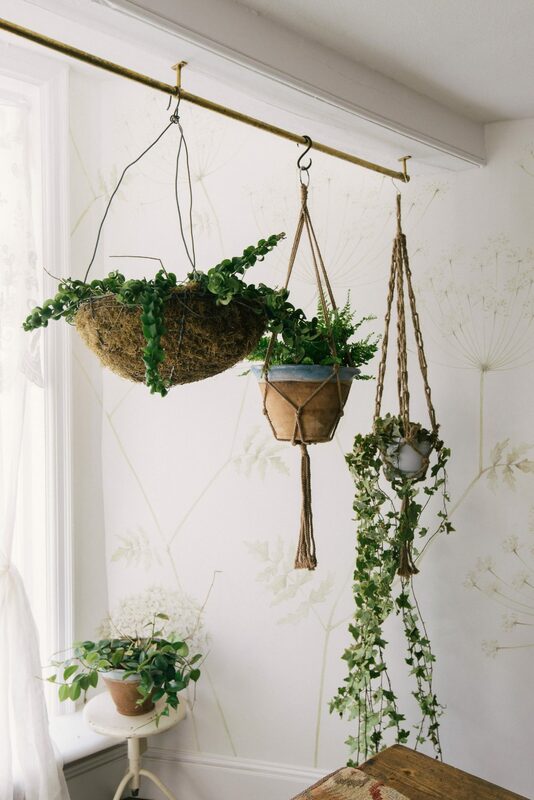 Coming from a Textiles Design background, I’m an absolute sucker for a gorgeous texture and I’ve always had a soft spot for hand-thrown ceramics. 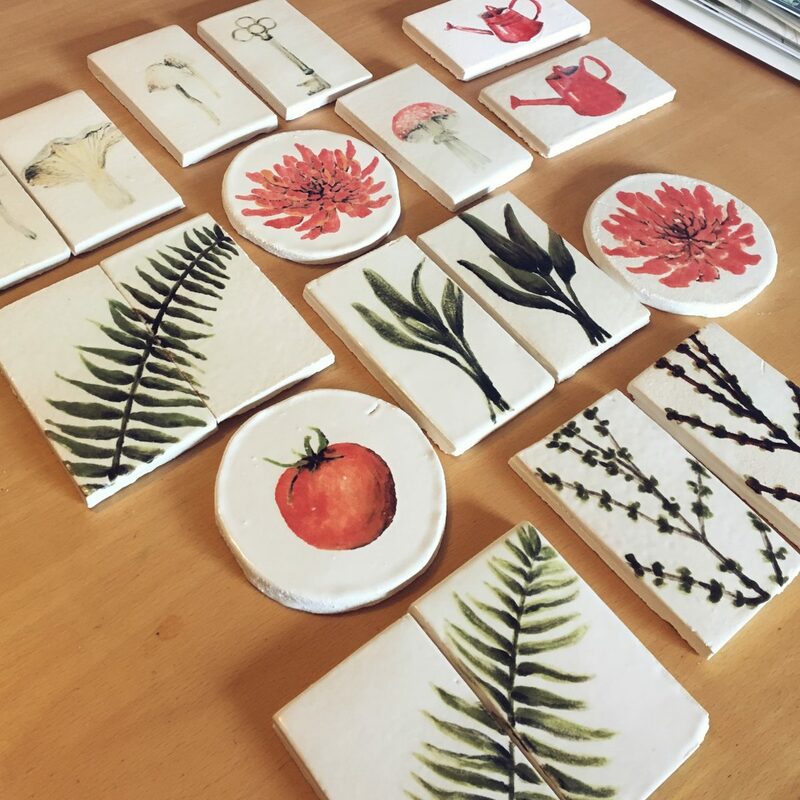 I think I could probably spend hours in the ceramics studio exploring all the beautiful things they have made in there – they use the most exquisite hand mixed glazes that sit so perfectly next to the rough texture of the clay. Exploring this area has been a huge challenge as I don’t have much experience in the way of ceramics. All 3 of our ceramics girls, Claire, Kat, and Hannah, have been such a huge help in showing me how to glaze and fire clay and letting me know the best materials to paint with. We have experimented with lots of different techniques, trying to find the best way to produce a really organic, unique image. 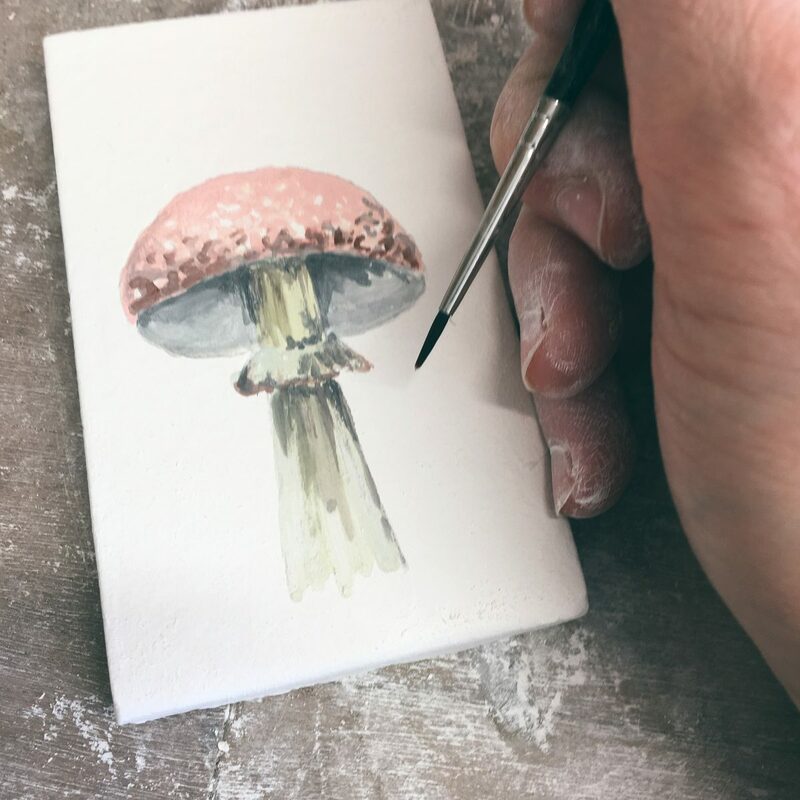 I had to adapt my painting style to paint on top of white glaze because it is very powdery and everything dries so quickly. A whole bunch of tester tiles. It’s fun to look back at what worked and what went completely crazy in the kiln. Loving this colour scheme that we settled on. 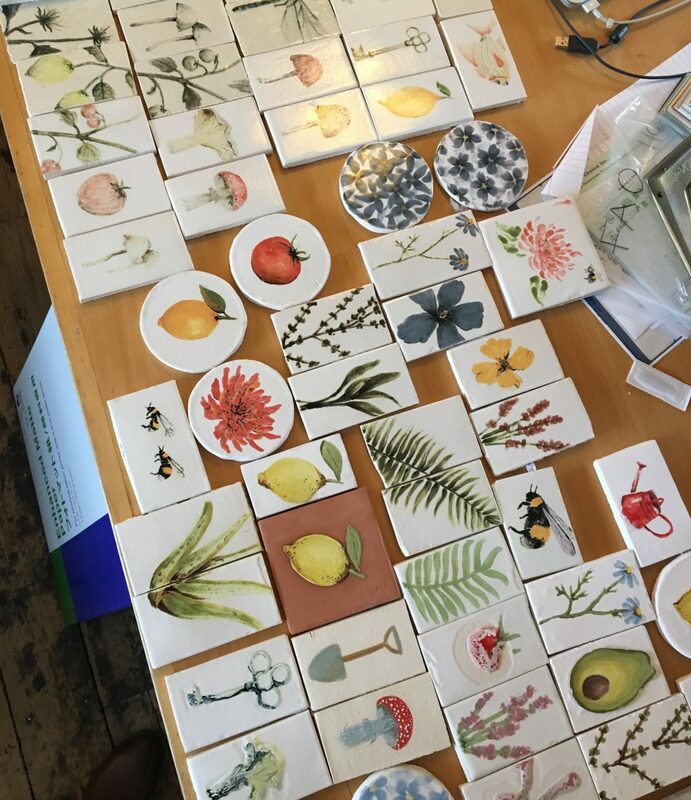 I’ve now started working closely with Claire, who has been patiently throwing me tester plates and helping me fire my tester tiles. I’m really happy with the latest plates to come out of the kiln, which is such a relief as I quickly found the world of ceramics to be a very unforgiving place! That’s all from me for now. Thanks for reading, I hope you’ve enjoyed my journey so far. 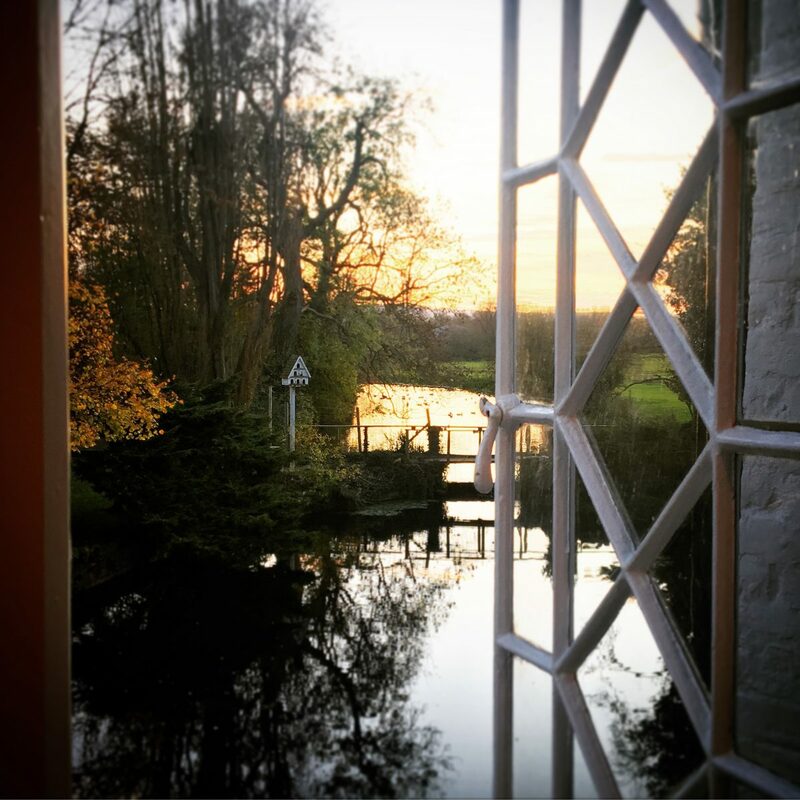 I’ve loved sharing a little insight into my life here at Cotes Mill! View Claire’s amazing current tableware here. Have a closer look at our Curiosity Cupboard here.